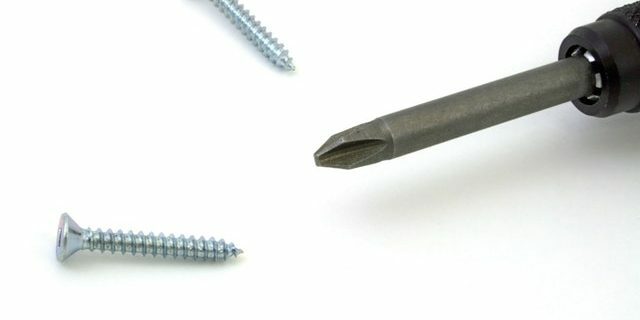 Have you encountered a stubborn Phillips head screw that won’t budge after fastening it into a hole? It’s likely that the friction used to tighten the screw initially is making it impossible to unscrew. The next time this happens on a job, try persuading the screw to loosen with a hammer. Insert your screwdriver into the stubborn Phillips head screw and then strike the handle of the screwdriver with a hammer. The impact will send a shockwave through the screwdriver into the screw, breaking the friction holding it in place. This will also help the screwdriver “bite” the screw head more securely by forcing the tip of the screwdriver into the screw slot. Make sure not to smash the screwdriver too forcefully or you’ll risk injury to yourself or damage to your tools and working materials. If one strong tap with the hammer doesn’t loosen the screw, one or two more should do the trick.